Big changes for Kinsey in this story. She was fired from California Fidelity Insurance and lost her adjoining office space. Now she’s working for attorney Lonnie Kingman and takes over the investigation of a case after Morley Shine dies of a heart attack. The files are a mess and she has to track down information and interview witnesses from the criminal case where David Barney is acquitted of the murder of his ex-wife Isabelle. Kingman is bringing civil charges against him. For anyone who wants to understand the legal system and how it works, Grafton describes the process in this book and gives a good overview of what is going on before a trial. David looked like a good suspect. Isabelle was the one with the money, and he would lose financially in a divorce. He was obsessed with her and harassed her like a love-struck stalker, and a gun went missing at a party where all the suspects were present. Unfortunately, several witnesses place him too far from the crime scene to have done the shooting, and Kinsey has to find out who did the murder. Grafton moves in two circles of suspects. Isabelle hurt her family and friends in one way or another. She also adds a subplot about a fatal hit and run that turns out to be the key to the murder. The other circle of suspects revolves around Morley and that holds several surprises. This one has a surprise punch after a few jabs and was one of the best so far. When I was half-way through this book, I realized I had read it before but only remember parts of it. Grafton departs from her usual story plot and places Kinsey undercover instead of investigating a crime. It starts with Parnell Perkins dead in the parking lot and a new boss, Gordon Titus. Someone is filing false claims and Kinsey tracks down Bibianna Diaz. She befriends her at a bar where she runs into an old classmate, Jimmy Tate, who was a cop but got into trouble. While eating, Bibi’s old boyfriend, Raymond Maldonado, who is head of the insurance fraud scam, sends his brother and his wife to bring Bibi back. Tate shoots the man, wounds the woman, and Bibi and Kinsey are arrested. She uses a fake ID of Hannah. Dolan asks her to go undercover and find evidence against Raymond. Grafton wanted to have some fun with Kinsey. She gets to dress up and try on a street-wise girl personality, she gets to go to jail and make new friends, and she is held as a friendly hostage in Raymond’s apartment where a pit bull takes a fondness for her. She figures out where the files are and has plenty of names but hangs around longer than common sense dictates although Grafton tries to justify the delay. But what really doesn’t make sense is Dolan leaves her out to dry without any contact or help. She is on her own even though an LAPD cop is with the gang. Nobody seems to realize how dangerous Raymond is. The book is short, 200 pages, and could have used some different twists and turns. Dolan certainly owed her an apology and instead puts her on hold when she finally gets a phone in her hand and calls him. What??? Grafton reveals more about private investigator Kinsey Millhone who is celebrating her 33rd birthday on May 5. A fellow Taurus. She is also 5 foot 6 inches and 118 pounds. I like her even more. Her apartment, which was blown up in ‘E’ is for Evidence has been rebuilt thanks to her wonderful neighbor Henry. She is hired to find Agnes, 83, the mother of Irene Gersh who lives in the desert. She also finds out a hitman has been hired to kill her because of her work to put Tyrone Patty in jail. The girl is popular. The two problems intersect when the hitman, with his 5-year-old son in tow, runs her VW off the road. This leads her to hire a bodyguard, Robert Dietz. Agnes keeps talking about falling chimneys and the Bronte sisters and escapes from the nursing home her daughter puts her in. The search leads them to the home for the elderly. The hitman shows up and Irene has a meltdown. A tea set her mother had in the desert also sets her off. In the midst of all this, California Fidelity has a retirement party, and Vera sets Kinsey up with a blind date, only to have Kinsey turn the tables on her so that she ends up with the doctor. Kinsey and Dietz discover their own chemistry. Agnes is found but dies of what the medical examiner calls “fright.” The hitman kidnapped his son, and Dietz contacts the mother. The hitman doesn’t kill for money. He likes it. While Kinsey is evading being shot by the hitman, she helps Irene figure out the secrets Agnes went to the grave with and why. Kinsey spends most of this book black and blue and still manages to attract Dietz, who is so much like her, it’s a bet he’ll return in the future. This was a simpler story without too many suspects. Grafton revealed a little more about Kinsey’s personality and if you haven’t read any other books, reveals her parents were killed in an accident. Her aunt, who died 10 years ago, told her no sniveling. Her life was molded by those events. 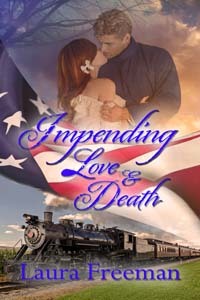 Cass Beecher hopes Sergeant Zach Ravenswood will fall in love with her on an outing to Ford’s Theater, only to have their world turned upside down with President Lincoln’s assassination. Her romantic plans continue to be thwarted by family, friends, and a mysterious stranger. Can she save the man she loves from the enemies that plot to ruin him? Zach thought with the war over, he could turn his attention to wooing the lovely Cassandra, but a fortune teller’s dire predictions begin to come true when a fire disfigures him, a nun poisons him, his uncle steals his inheritance, and he’s shot. Is he going mad or is everything not as it appears? “We were asking about the horse sale!” Ethan shouted. “The sale is on Saturday. You should return then.” She pushed the door closed. The clank of a bolt locking the entrance echoed from inside. “Well, I never.” Cass stared at the wooden barrier, willing it to open. “We’re here to see Zach! If he’s ill, I can help!” Her shouts were unanswered. “Come on.” Ethan pulled her away and helped her into the buggy. She turned. A curtain moved. Someone was watching them. “Old witch,” Cass repeated Ethan’s description. Grafton leaves her garage home when Royce Fowler hires her to prove his son Bailey didn’t kill his girlfriend, Jean Timberlake 17 years ago. Bailey escaped from prison a year after he confessed but was arrested under his alias. Royce has a sick wife, Oribelle, who runs the family hotel while complaining about her ailments. Their daughter Ann has quit her job as counselor at the high school to care for her ailing parents but they are driving her insane. Grafton goes back and forth from the present situation to the past crime as she introduces characters who were involved with Jean, who was pregnant when she was killed and looking for her biological father. Bailey maintains his innocence but during his hearing, his best friend Tap shoots up the courtroom with a shotgun loaded with rocksalt, and Bailey escapes, hiding out. Tap is shot by police leaving his young wife with four children and another on the way. Tap and Bailey were into robberies and had $42,000 stashed with Jean, which has disappeared. Grafton keeps the reader guessing by adding a preacher, spa owner, and principal who had relationships with Jean. She also throws in a crazy spa owner’s wife who beats Kinsey with a tennis racket. Kinsey whacks her in the nose. Grafton is adding humor to her heroine’s personality. Kinsey also is carrying her new gun but doesn’t use it. Grafton gives us the reason, but the reader can see that Grafton wants Kinsey to be in peril and have to use her wits to get out of trouble. The characters had fuller backstories and the emotional assault on characters was as intense as the physical damage. Kinsey grows in her compassion for Henry, her landlord, from the experience. For writers, Grafton groups her suspects and makes it easier to identify them as she adds clues and complicates the plot. Only Kinsey Millhone would be upset to have $5,000 deposited into her bank account by error. She’s working on a routine fire investigation before Christmas on the Wood/Warren property. Kinsey is typing on a Smith-Corona – the same typewriter I bought in high school with my hard-earned babysitting money. I feel like a kindred spirit. Grafton has Kinsey explain how she tracks someone down and uncovers data with wits and a pen. She describes the scenery and people with a list of descriptive phrases. Her multiple characters are easier to keep separate in this story but she gives them good and bad traits so it’s hard to tell who to suspect for the crime. The holidays are depressing for Kinsey because her neighbor, diner owner and favorite cop are all out of town. Kinsey goes to the burnt warehouse and does the paperwork. The family consists of Linden, who died two years ago, Ashley, Lance, Olive, Ebony and Bass, the black sheep. Olive is married to Terry Kohler, now VP of the company. She turns in her work only to find out after Christmas that the folder has been altered and she looks like she’s a co-conspirator in the arson and fraud along with Lance, the owner of the company. Kinsey is her own client as she interrogates the family, employees and a widow of a man who looked like he committed suicide. The clues are subtle but begin to add up. Greed seems to be the motive and there are plenty of suspects. Kinsey is visited by her second ex-husband Daniel, and Grafton gives us more personal background on Kinsey. Daniel is surfer good looking with bad addiction habits. She discovers his reason for leaving her eight years ago after a year of marriage. I won’t tell. Thank goodness Grafton wrote this in 1988. She did thorough research on bombs down to the size of the box and how it would kill or burn anyone close by. Today, if she did the same research, she’d have the FBI knocking on her door. Mystery writers are always looking out their window for that black SUV parked on the street.